We have to WAIT for our morning walk. SHE says SHE can't work three retractable leads...with three exuberant terriers, wearing gloves. Or constantly take burrs out of paws. So WE have to WAIT! Male scottie, or just Dui? 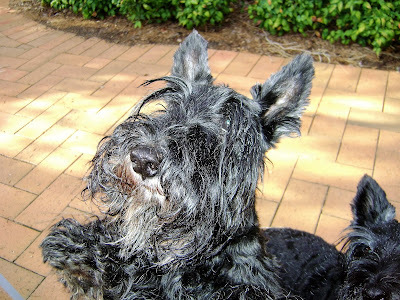 It has been YEARS since we've had a male scottie. He is so different to the girls, that he puzzles us sometimes. We understand the leg lifting. what rises above the rest must be wee'd on. Dui races from side to side to lift his leg on everything. go, he's empty, so it's just a leg lift. 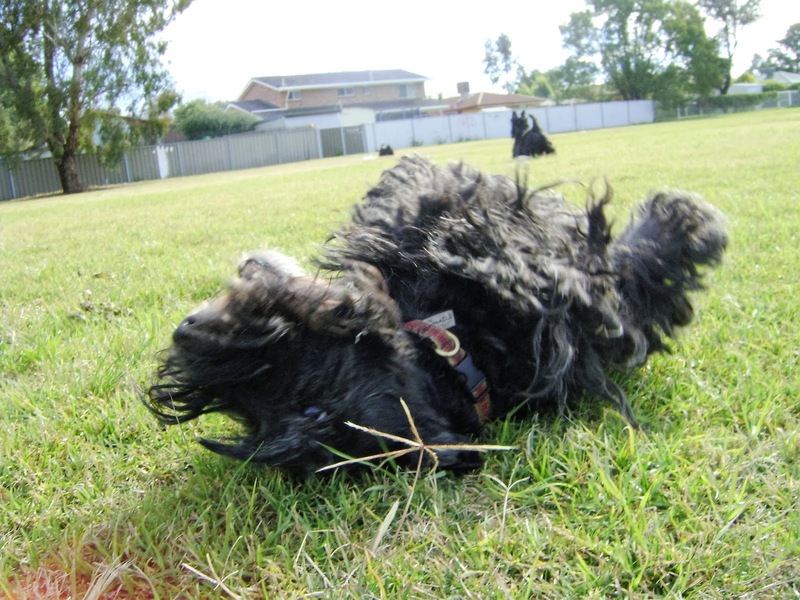 However, he also lifts his leg against a tree, to poo! shrill cry, and then lays down to await assistance. lunges at them screaming in anger. ripping the trousers of two. He loves chasing anything on wheels. trucks, he races to the side. He has to be watched every minute when out of the yard. In the mornings, he is snuggly. He won't get up until he has been cuddled and properly worshipped. 'if this is all there is, I'll have it' attitude. We've heard that people have Names for their vehicles. Frankie and Ernie have had Jennifer jeep, and Jessica jeep. What do you call your mode of transport? That would make a great book title...BOL! I am a Designer Dog. She says designed by a committee. I have TWELVE brothers and sisters! She says it probably explains my wonky leg. Sadly, seven of us ended up in a high kill shelter. BUT we were rescued by a wonderful foster mother. my birthday was 22nd of May. The same day as Kendra's. So we always think of her. We celebrated with a Kangaroo, sweet potato and green bean cake! And look who turned up to celebrate with me! 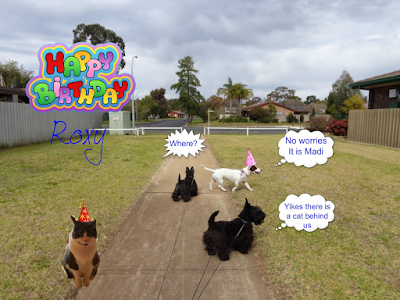 Thanks Madi, for the wonderful card! Happy Birthday to all of my sisters and brothers! I only know where four of you live now, but know you have wonderful homes! We've had a MAJOR change here. Which sounds okay on the surface--more treat money. BUT the downside is, we are not allowed in the CAR during the week because SHE says we smell it up and make it a mess! And SHE doesn't want to constantly clean it....sheesh! So going to the river on the weekends is more exciting. Tuna puree with a kibble decoration! Recently, the scotties have been hanging out together more. Dui used to follow Roxy around all the time. 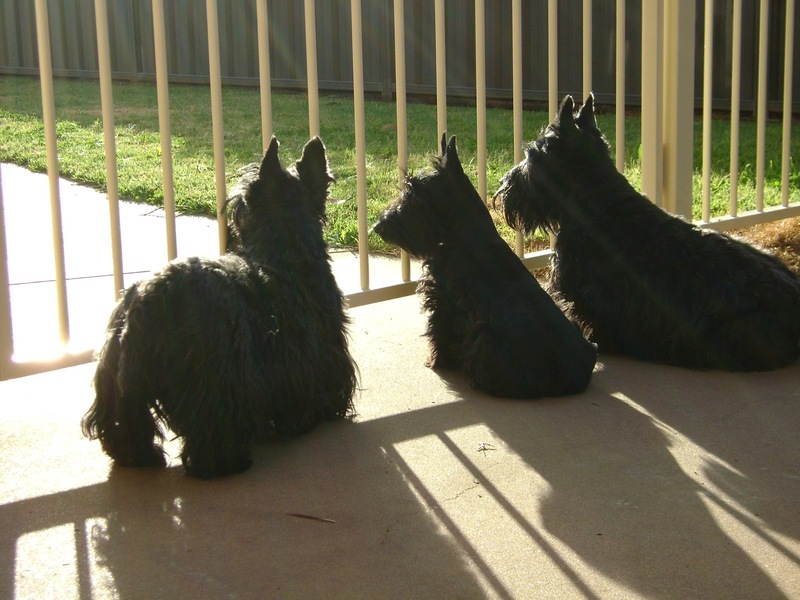 But now, the scotties are usually together....on guard duty. while Roxy is a couch potato. Dui resorts to his naughty little brother routine and teases Bella relentlessly. Bella will not go outside until both Roxy and Dui are in the car. Food is VERY important to us. SHE calls us stomach hounds. The blanket and upturned plant pot is an attempt at keeping Roxy out of the dirt! you can see in the photo. So food, good food is important to us. We have an excellent quality grain-free kibble as a base. Monday: Raw chicken, necks, legs or wings. Tuesday & Wednesday: Grain-free wet food. We get one-sixth of a small tin of beef, kangaroo, lamb or duck. Sometimes the kibble is mixed with rice or pasta. Saturday & Sunday: cooked chicken gizzards or hearts. The amount of kibble is adjusted according to the topper. We love dinner time. Do you have an eating schedule? to replace her running tights! You may have noticed that a puppy was added while there was an older dog. The older dog helps with puppy training, and the puppy never has to be left alone at any time. After Carys, there was a vacancy. At the same time HER mother died, and SHE received a small inheritance. Time for another scottie. coinciding with a planned trip to the big city! Sunday morning, Mother's Day, SHE went to view the pups. There were six, SHE sat in the garden watching their antics, but one, kept coming over and just standing in front of HER staring. 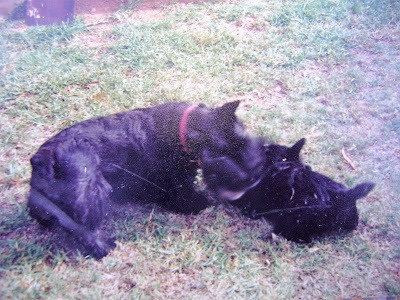 Daisy (right) with a brother. Naturally, SHE took the one that had chosen HER. So Hemskirk Charisma became 'Daisy'. First night after a 6 hour drive, with Kendra. Daisy was the ambassador scot. SHE loved life and everyone in it--except cats. She was the one who let children and strangers pat her. Age was catching up with Kendra, she couldn't walk far, spent a lot of time sleeping, though rallied to bark at cats and eat. The call of the scottie came again. A breeder who had saved the pick of the litter for breeding, discovered that the puppies and mother had signs of demodectic mange. SHE researched the condition and found that is was curable, so SHE agreed to take the little girl. Bella arrived--with name, and a bottle of sheep dip she had to take every morning for a few weeks. Bella, the new member of the Cat Surveillance Team. Next there was an event in Blogville. Everyone was asked to post about an animal that needed to be Rescued. 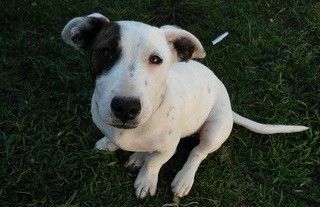 A Bull Terrier-Rhodesian Ridgeback who came with the name Roxy, joined the pack. Age caught up with Kendra and she went to the Bridge. Followed by Daisy, taken by cancer. 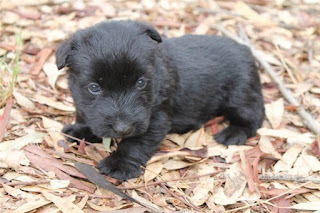 and probably last, scottie joined the pack! Thus ends the History of Scotties! Scottie number 6 arrived after Emily went to the Bridge. Fiona and Carys became great friends. SHE has the fond memory of Fiona, looking wounded walking through the house with a tiny scottie firmly clamped to her tail. Carys was a gorgeous girl through and through. Both Fiona and Carys could go anywhere and were welcome. 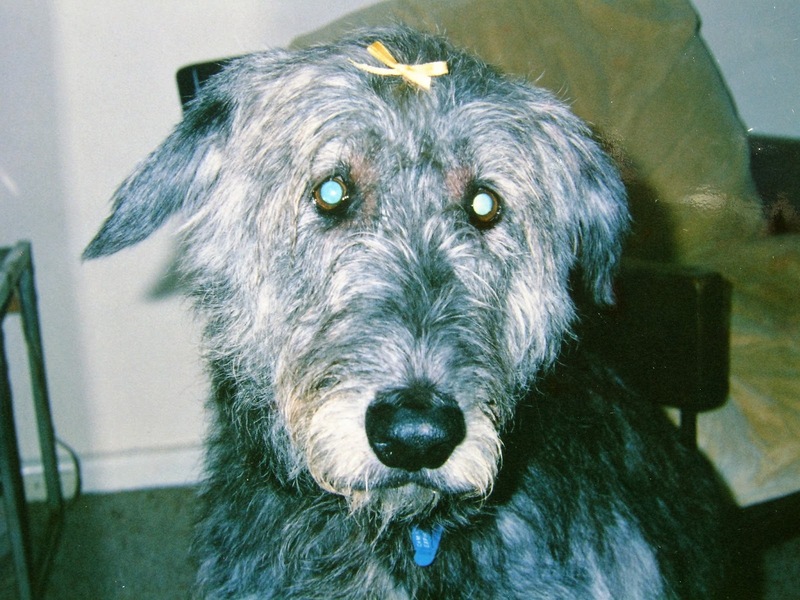 Carys became an ONLY dog for years. SHE got a promotion and moved from Sydney to Dubbo. Carys the constant companion. A true heart dog. It was time to buy a new house.....and a scottie. 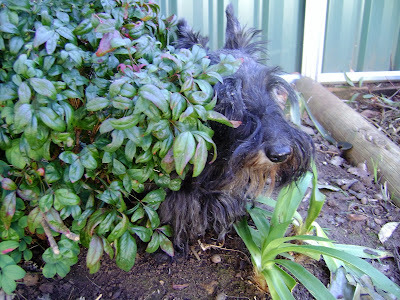 Kendra--called the Bush Pig by a friend. Now, Kendra was that puppy they always warn you NOT to get. She was 15 weeks old, and the story was the breeder's husband who usually socialised the puppies had been sick and the puppies had just been running loose in a pen. Kendra never warmed to anyone other than HER. And Carys, who went to the Bridge at 14. 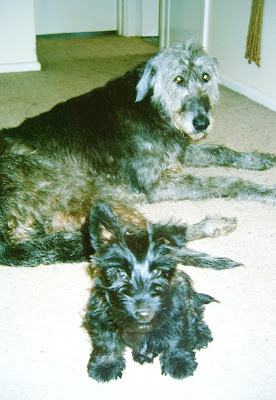 SHE got along with dogs--hated cats and people. One of her favourite tricks was to walk around people and nip their ankles from the back. Friends soon learned not to turn their backs on Kendra. Kendra after a bad grooming session. SHE and Kendra loved each other. 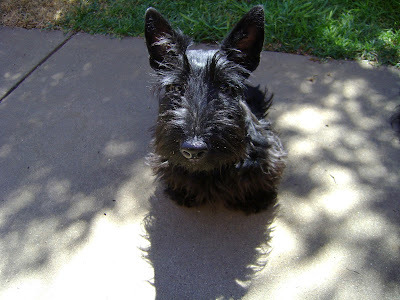 Kendra was the only scottie who naturally sat up when there was a treat in the offing. When visiting, she would hide......until an ankle came by. Kendra helping herself to the baguettes on the way home from the shop. We started blogging with Kendra, so we have lots of photographs. One of life's unique characters. But first.... for Kismet. Three of the puppies died.....one completely rejected by the mother, two were just weak. Though the Vet prescribed supplemental feedings, he said they just didn't feel like 'gristly sausages' so they probably wouldn't survive. They didn't. But the remaining four went to happy forever homes. SHE decided on something completely different. The thought of a No Dog home just wasn't in the equation. 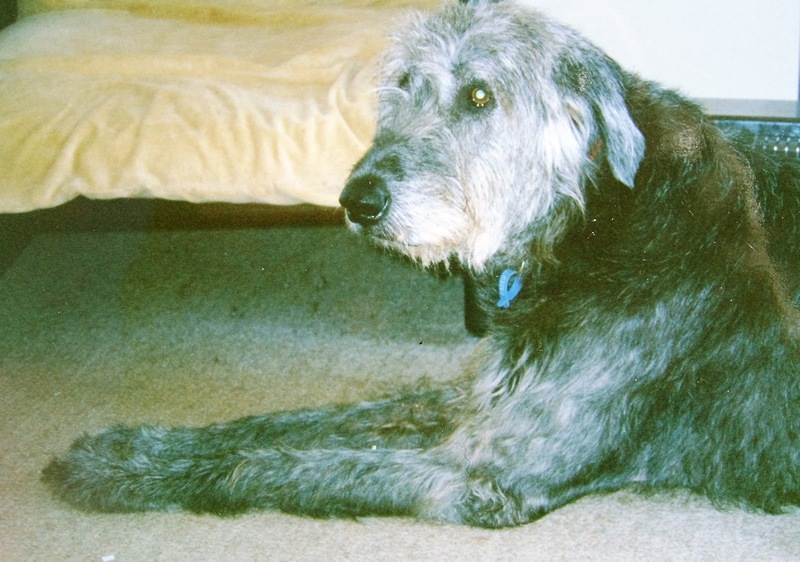 The typical huge, gentle wolfhound. Fiona thought she was a lapdog. The ribbon is from the groomer. Emily, was a deerhound X....much more X than deer. She looked like a black, prick-eared greyhound. popular at the time for little girls. Fiona came with her name. Sadly, large dogs do not have long lifespans, and their allotted time on Earth went by all too quickly. Scottie FIVE made a brief appearance at this time. 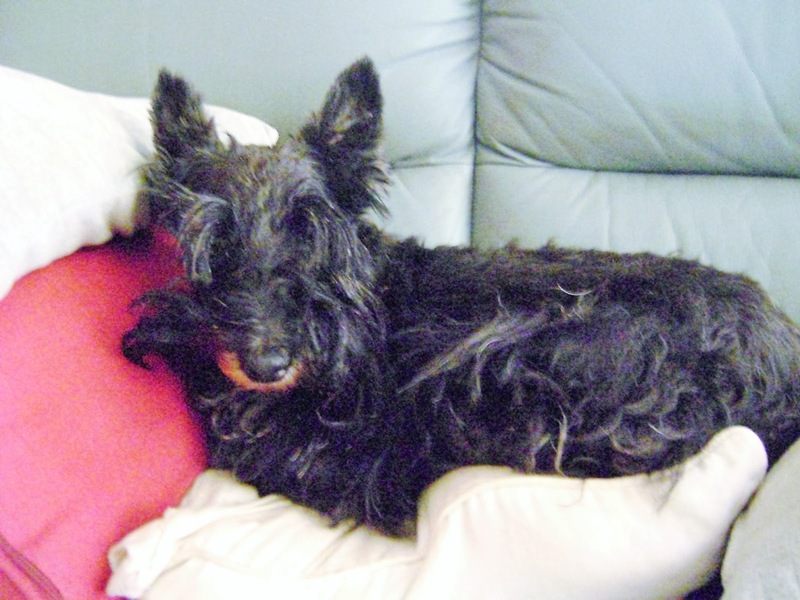 there was a little male scottie, Geordie, brought in for grooming and never picked up. SHE payed his grooming bill and he joined the household. He was hit by a car a very short time afterwards, while SHE was at work. As the fences were intact, no holes or other escape routes, probably someone let him out.....kids did walk past going to school.